Takeda Pharmaceutical Co. will likely see a sharp hit to its finances if its bid to buy Shire Plc succeeds and it borrows tens of billions of dollars to pay for the deal. nearing a preliminary agreement to acquire Shire after the Japanese drugmaker sweetened its roughly $60 billion bid for the biotechnology company, according to people with knowledge of the matter. Observers expect Takeda will first tap short-term bank loans, before replacing them with longer-term funds via bond sales or other means. 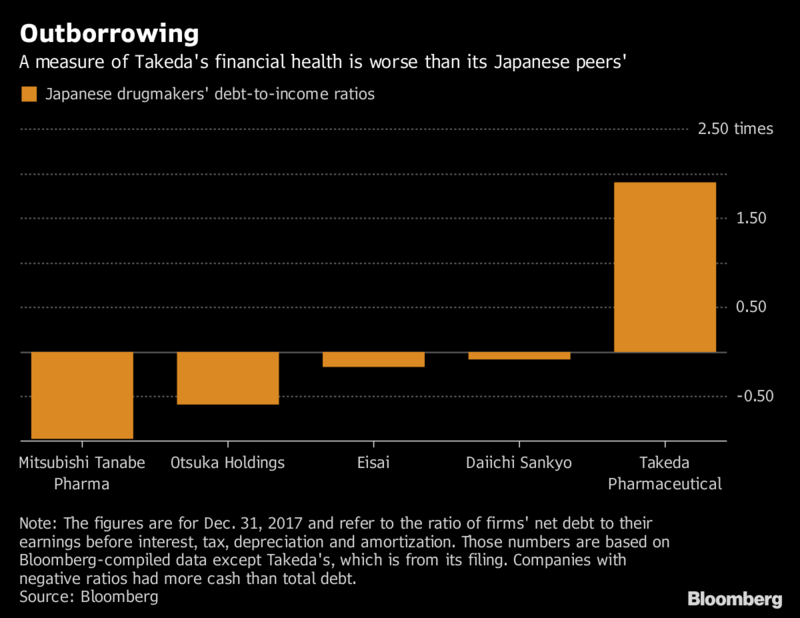 S&P Global Ratings has said the acquisition could hurt Takeda’s credit score, while investors have begun to demand higher premiums for holding its debt. If the firm borrows all of the cash portion, its ratio of net debt to earnings before interest, taxes, depreciation and amortization could temporarily worsen to 5.4 times, Mizuho Securities Co. estimates. That would exceed figures for some Japanese competitors. It would also be up from 1.9 at the end of December, according to Takeda results. “Takeda’s credit could be downgraded to junk temporarily, probably just for the short-term — six months or one year’’ if it goes ahead with the acquisition, said Atsushi Seki, an analyst at UBS Securities Japan Co.
meeting April 5 that he intends to maintain Takeda’s dividend and investment grade, according to reports. A Takeda spokeswoman declined to comment. downgrading it last year on its $4.7 billion acquisition of Ariad Pharmaceuticals Inc. In the bond market, the yield premium on the drugmaker’s 2.45 percent dollar notes due 2022 reached a record 81 basis points in early April and was recently at 80, according to Bloomberg-compiled data. “I think Takeda would make every effort to get back to an investment-grade rating” if it were cut to junk, Seki at UBS said. “Clearly Takeda has some non-core assets” it could dispose of, he said. The debt ratio could improve to 2.8 times by March 2022 if the combined firm remained profitable, said Hiroshi Tanaka, a senior analyst at Mizuho Securities. Takeda generated 142.9 billion yen ($1.3 billion) in cash in the quarter ended December by selling real estate and share holdings, among other non-core assets, according to its filings. Takeda is pushing for the deal despite the hefty price tag because it needs to get lucrative new therapies to make up for the few late-stage experimental drugs in its own pipeline.